Each musical item in this program has been chosen to align with a specific painting from the National Gallery of Australia’s Renaissance Exhibition. St Sebastian and the Virgin Mary are venerated, the favourite song of the ruthless Cesare Borgia reveals his duplicity, the agony of the Crucifixion is given aural expression along with heightened emotions of secular love and jealousy. Music from the Early to the High Renaissance: Dufay, Desprez, Ruffo, Dalla Casa, Bassano, Monteverdi, Morley. During the performance, the corresponding images will be projected. 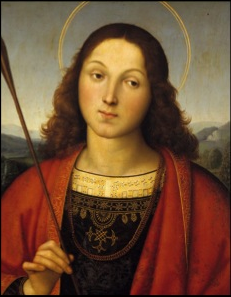 So after you have heard the serene, graceful polyphony of Dufay’s “O Beate Sebastiane” will you ever be able to see Raphael’s dreamily beautiful “Saint Sebastian,” without hearing Dufay’s motet? Or if you hear Dufay’s motet again, won’t that call to mind Raphael’s painting?